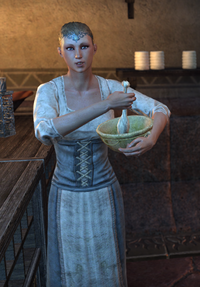 Gilbara Morrard is a Breton chef who runs the Waistworks Eating House in the Brewers and Fishmongers Hall of the Canton of St. Olms the Just in Vivec City. If engaged in conversation, she will say, "You look too skinny. You need to eat something. Here, try some of these. Isn't it delicious? ", "They say the fastest way to your lover's heart is through her stomach. And what's the fastest way to the stomach? Why, with a delicious meal, of course! ", or "I cook with love. Come to think of it, I do everything with love. Say, what are you doing later, hmm?" This page was last modified on 7 January 2018, at 19:50.